If you’ve had Soda Bread before, you probably know it’s great still a little warm from the oven and left overs? Well, not so much, but they still make great toast. I have a little something in store for that left over bread, though, so bear with me and I’ll have a post soon. * See left overs at bottom of page! One issue I had with the Ballymaloe recipe is that the dough was just a little too wet, and pretty consistently so. I made a slight adaptation in the recipe to hold a bit of the milk back, then add if needed. That method makes it a bit easier to get a good tender loaf than trying to work additional flour into the dough. Do make sure the dough is very moist, much moister than a kneaded type dough; it should be very, very soft and just be able to be picked up and patted into shape. As a matter of fact, this dough when properly mixed was much wetter than any soda bread recipe I’ve made before, and was cooked at a much higher temperature. It is also the best soda bread I’ve ever had. 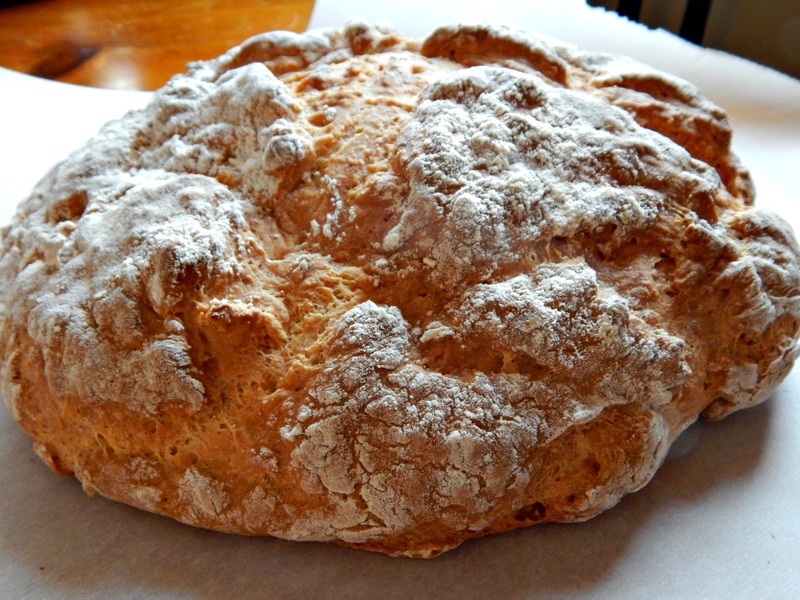 I guess those Irish know a little sumpin’ about making Irish Soda Bread!?! Admittedly this was not as high rising as some of our American Soda Breads, but was much better tasting! This bread takes no time at all to mix up by hand or with a spoon. Handle it gently! Do not beat, knead, make in a food processor or otherwise mistreat it and you’ll be rewarded. At Ballymaloe, they recommend buttermilk or sour milk. Since our milk here in the States is pasteurized or ultra pasteurized, it’s not recommended to use sour milk any longer, even in baking. My simplified “layman’s” understanding is that there are not enough “good” bacteria cultures left to crowd out any potential dangerous ones. Many do use sour milk, though, if the milk is just slightly “off” but it might not be acidic enough to react with the soda. Add a little vinegar, just to be sure. Use 2 1/2 tablespoons in the cup, then pour in milk to two and a half cups. Measure, then sieve the dry ingredients together into a bowl. Make a well in the center. Pour in all the milk at once, but hold back about a half of a cup. Using 1 hand or a stiff spoon, stir in a full circular movement from the centre to the outside of the bowl in ever increasing circles. The dough should be softish, but not too wet and sticky. If needed, add the additional milk. When it all comes together, turn it out onto a well-floured work surface. Wash and dry your hands. Tidy it up the dough, and flip over gently. Pat the dough into a round, about 1 1/2 inches thick. Cut a deep cross on the loaf and prick in the four corners. Bake in the oven for 15 minutes then turn down to 395 degrees for 30 minutes until cooked through. If you are in doubt, tap the bottom of the bread; when it is cooked it will sound hollow. Cool on a wire rack. Tip! Soda breads are best eaten on the day they are made but are still good for a day or so more, especially toasted. Store in a paper bag. Recipe slightly adapted from Ballymaloe’s White Soda Bread as well as changed to Standard American measurements and temperatures. If you bake a lot of bread, you might want to consider a kitchen slicer! You can see how beautifully my cheap ones worked on this loaf! I also use mine for a number of different things. 30 to 35 bucks – never buy lunch meat again & cuts so many things a food processor won’t. I was going to post my take on these Farmhouse Cheese & Caraway Bread Puddings made with Irish Soda Bread. I didn’t like them! They were gorgeous when they cooked up, taste was fine, but the texture was off putting. I could have just posted them; they photographed beautifully, but that would have put me into the Lies, Lies and More Lies Category. Check out the recipe if you’d like; maybe it was just me. I thought I might make a second go of the puddings with a few adjustments – less liquid, more cheese, perhaps even a little bacon, but Gibson snatched the remainder of the Soda Bread off the counter and devoured it in about 20 seconds flat. My second thought was to use the slices as crostini! Toast them in the oven and spread them with my Mother’s Smoky Salmon Spread. I’ll still post the spread, but on another bread. Gibson – This was winter of 2013 – 2014; our snow is gone now! 🙂 Those little curly things are candle holders. I forgot to pull them out before the ground froze and they stand about 4 to 4 1/2 feet off the ground. My neighbor took the photo when Gibson bounded over to say hi! This entry was posted in Click here for Fabulous Food Posts and tagged Bread, Buttermilk, Easy Recipe, Frugal Hausfrau, Irish, Quick Bread. Bookmark the permalink. 🙂 I wish you could try it! Hooray! 🙂 I think it makes the crust a bit crispier and lighter, too. Wow rustic looking bread… lovely post Frugal. .. This bread looks amazing. I love fresh baked bread. It is a weakness second only to butter or maybe chocolate? Oh my I am just weak. Beautiful, and the bread slicer sure made some great looking cuts. Thanks, Loretta! Sometimes I don’t think it’s even worth pulling it out of the closet – until I do! LOL! But you know what else is in that closet I haven’t used for awhile? My waffle maker and ice-cream machine. It must be the carb closet! But I’m inspired! Thanks, Lili! It’s the simplest thing in the world! Good idea! Homemade bread is so much nicer anyway! I’m heading to Ballymaloe cookery school in a few weeks, hopefully i’ll be enjoying this there! Oh my gosh, I sure hope you’ll keep us informed and post a few recipes! 🙂 What an amazing opportunity! I’ve only made Irish soda bread a few times but it’s always turned out well and is a very fast recipe to throw together. I don’t know why I don’t think of it more often, besides maybe that we’re not huge bread eaters, here. I think it would make great crostini!